Looking to ignite pre-launch excitement among small-business partners, Microsoft speakers at the SMB Nation conference started the drumbeat for Windows Vista, Office 2007 and other major upcoming product releases. "We're at the beginning of a growth wave for your business and ours," keynoter Marie Huwe, general manager for marketing in Microsoft's Worldwide Partner Group, told attendees at the privately run conference. Held on the company's Redmond, Wash., campus in September, the event attracted 600 people from as far away as Australia. Now in its fourth year, SMB Nation caters to the vast community of one- to five-person resellers, integrators and solution providers that primarily serve small business customers. Microsoft views the small-business market as a rich potential source of future sales growth. According to internal company data cited by Huwe, the world's 40 million small businesses spent $37 billion on software in 2005. Microsoft expects that figure to rise by 10 percent in 2006. Huwe and other Microsoft speakers positioned Vista and Office 2007 as offering significant revenue opportunities for small business partners. Microsoft anticipates $20 billion of spending by businesses of all sizes on Vista deployment services in the next two years, said Brad Brooks, general manager for Windows client product marketing. Meanwhile, Rachel Bondi, a senior director in Microsoft's Office product group, predicted that Office 2007 will spark increased demand for partner services as well. Some conference attendees, however, questioned whether penny-pinching small businesses will be clamoring for Vista and Office 2007 anytime soon. "Our customer base is probably three years behind the power curve when it comes to early adopters," said Randall Spangler, president of Chesapeake, Va.-based integrator MERIT Solutions, a Registered Member. "A lot of them still use [Office] 97 and it works fine, so they're not going to upgrade to [Office] 2007 just because it's there." In addition to Vista and Office 2007, Microsoft speakers also encouraged small business partners to push Dynamics CRM. Citing data from Stamford, Conn.-based analyst firm Gartner Inc., Brad Wilson, general manager of Microsoft's Dynamics CRM product group, said that small businesses will spend $550 million on customer relationship management software in 2007. Wilson also referred to internal Microsoft research showing that the total value of a typical 20-seat Dynamics CRM deal is $73,200, of which 67 percent goes to partners. Turning his attention briefly to Dynamics CRM Live, Microsoft's forthcoming Software as a Service (SaaS) CRM offering, Wilson said that while plans call for Microsoft to host that product itself and bill customers directly, the software giant will share a yet-to-be determined portion of its subscription fees with resellers. Presentations on topics such as negotiating mergers and acquisitions and building a managed-services practice drew the largest crowds. "The business tracks are always more popular than the technical tracks," said Harry Brelsford, CEO of SMB Nation Inc., the Poulsbo, Wash.-based company that sponsors the show. Because they're small businesspeople themselves, most attendees have technical backgrounds and limited management experience, Brelsford noted. Most come to SMB Nation to learn about growth strategies and leadership techniques from peers and experts. Countries or regions in which Microsoft has subsidiary offices*; locations range from Argentina to Zimbabwe. 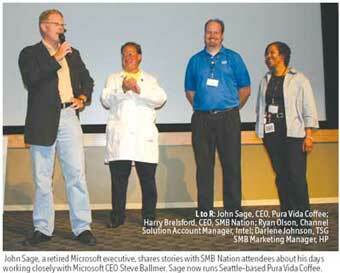 For Microsoft, SMB Nation offers direct access to the small IT shops it was targeting when it created the Small Business Specialist (SBS) partner designation in July 2005. SBS status is open to any member of the Microsoft Partner Program, including Registered members, provided that at least one employee has passed a small business marketing and sales assessment test and one of two technical exams. According to Robert Crissman, Microsoft's general manager for U.S. partner enablement, there are currently about 7,500 Small Business Specialists worldwide, including 2,500 in the United States. Microsoft aims to double that number during its current fiscal year. To that end, Microsoft executives announced the creation of a team of telephone-based Partner Account Managers (telePAMs) for U.S.-based Small Business Specialists, enabling those partners to have a direct relationship with Microsoft for the first time. Paige Boesen, a marketing manager in Microsoft's U.S. Small Business Specialist partner group, promised more benefits as that community expands. "As we continue to get bigger, it only gets better," she said.